Home CIH funny sign industrial hygiene blog Industrious Hygienist occupational safety and health professional safety stress too busy for safety Too busy for safety? I don't think so. Too busy for safety? I don't think so. I�ve recently binge-watched BBC's "Sherlock" and got to thinking about body language and how to improve my observational skills. More specifically, I wanted to evaluate my body language when someone comes into my office or approaches me after a meeting � usually to ask for help with a safety issue. Does my body language communicate how I feel? Do people feel they can approach me with safety concerns without fear of reprimand or dismissal? Or do they feel I�m too busy/stressed for their particular question? Why smile? An article in Forbes on �The Untapped Power of Smiling� discusses a few benefits of a smile in defusing tense situations and connecting with others. A smile has the same meaning in many different societies. It is hard to frown and stay unhappy or stressed when interacting with someone who smiles. The physical act of smiling can make us feel better. A number of studies have been completed on the health benefits of smiling. Smiling is associated with: reduced stress hormone levels (cortisol, adrenaline, and dopamine), increased overall health, increased mood-improving hormone levels (endorphins), and lower blood pressure, to name a few. When we smile, we appear likeable and courteous, but we�re also perceived to be more competent by those we are interacting with. When you are serving as a safety manager, you�re in a position of trust. You need to behave in such a way that people trust you, trust your judgment, and try to understand your reasoning. So, say it with a smile. There are ways to �open up� your body language, and there are also ways to open up a discussion. For body language, movements such as angling your body towards the person you are speaking to, sitting or standing up straight, un-crossing your arms, and making eye contact would be a great place to start. Don�t consistently check your cell phone or computer while speaking to the other person. An article in Forbes on �10 Simple and Powerful BodyLanguage Tips for 2014� explains additional methods for improving your body language. About to have an intense meeting? Nervous in large groups? Try this. Not sure when to stop a meeting? Not sure if you�ve �lost� your audience to boredom? Also watch for people putting pen caps back on, closing notebooks or notepads, closing their tablet case, and putting their pen down. Your meeting is over. They�ve stopped listening. You�ll have to try to get their attention another way. Need a quick mental pick-me-up to re-engage your focus throughout the day? Feeling overwhelmed? I like to strike a quick yoga mountain pose with my office door closed before a meeting or site walk. Per the Forbes article, if you keep your personality and posture relaxed, inclusive, and open, your coworkers and upper management will likely respond with cohesive, positive, and productive attitudes. What about opening up a discussion? Are you just sitting across the table, barely making eye contact, waiting for the person talking to you to finish so you can interject your opinion? Or are you listening to their words, their tone of voice, and waiting to solve the problem until you�ve heard it all the way through? There has been an increased focus on �active listening� in the media and in career-building circles. When you start asking questions, this presents an opportunity to discuss the problem and educate the person you are talking to. But if you haven�t really been listening, you might not fully understand the problem. You don�t need to work to develop Sherlock Holmes� skills of deductive reasoning � just use your eyes. Make direct but not intimidating eye contact. Is the person you�re speaking with nervous or afraid? Are they angry? Have they just come off a long shift? Are they exhausted? Do they look dehydrated? Sometimes people will �blow things out of proportion� or come in to my office, eyes strained, veins pumping, face flushed, and ready to do battle over whatever issue is bothering them. Usually once I ask them to sit down to talk, offer them some water, and give them a chance to �blow off some steam,� they�ll come to a resolution for the problem on their own. They just need to work it out in a positive environment, free of the stimulus that was upsetting them. I hope I�ve been doing better in listening and not pretending I know the ultimate answer to every safety or industrial hygiene problem that pops up. I�ve noticed that smiling at people, opening up my body language, fully listening to the issues brought to my attention, and using my eyes have helped improve my personal and professional relationships. The Industrious Hygienist is never too busy for safety. 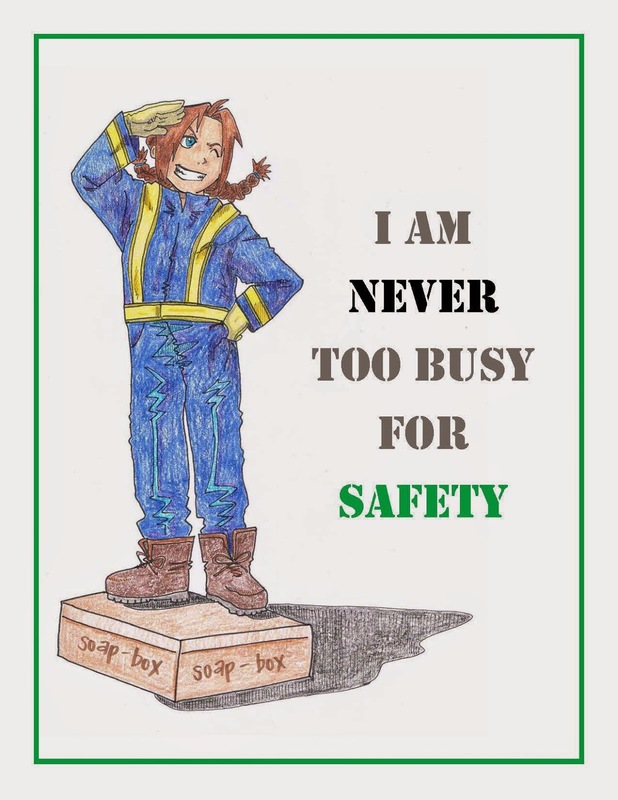 So here�s my commitment to current and future clients, co-workers, and management: I am never too busy for safety. Stop me and ask your question. I'll try to give you my full attention and really listen to what you have to say.